Autumn is also the perfect season for puddings. Forget gelato, it’s time for apple crumble and this week’s book is all about that classic pudding ingredient – golden syrup. The recipes opposite from The Lyle’s Golden Syrup® Cookbook by Tate & Lyle will bring a little sunshine to the autumn days. Lightly grease a 22x3.5cm deep loose-bottomed tart or cake tin with butter. Break the biscuits into large pieces, then whizz them in the bowl of a food processor or crush them in a plastic bag with a rolling pin until you have fine crumbs. Pour the biscuit crumbs into a bowl. Pop the butter and the golden syrup for the base in a small saucepan and heat gently until the butter has melted, then pour over the crumbs and stir until combined. Spoon into the prepared tin and press out to make a level base. Transfer to the fridge while you make the topping. To make the lemon cream, mix the mascarpone, lemon juice and zest, golden syrup and sugar together in a bowl until smooth. Carefully spoon the mixture over the chilled biscuit base, smoothing the surface. Return to the fridge and chill until firm. Remove the cheesecake from the fridge about 15 minutes before serving, so the base can soften a little. Carefully lift the cheesecake out of its tin then use a flat-bladed knife to remove it from the base and transfer it to a serving plate. 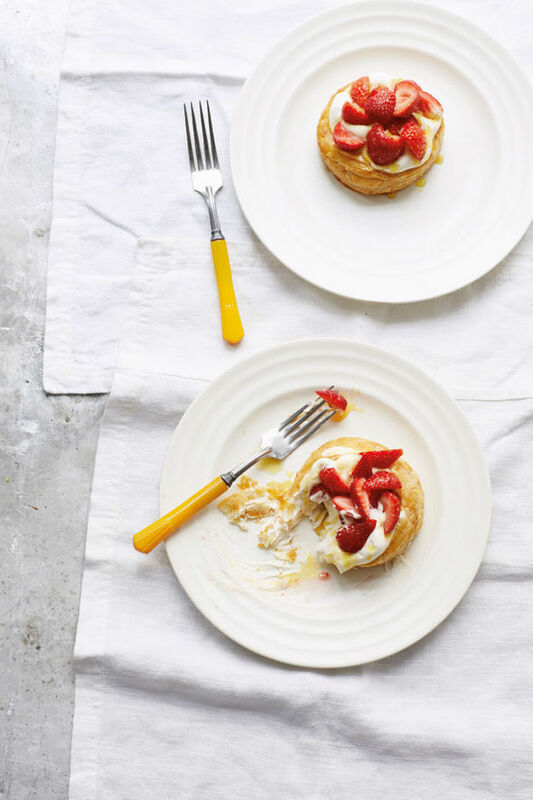 Arrange the berries decoratively on top, drizzle over some golden syrup, scatter with lemon zest and serve. Preheat the oven to 190°C/375°F/Gas Mark 5 and line a baking tray with baking parchment. Lay out the puff pastry and, with a 10cm pastry cutter or an upside-down glass, cut out 4 rounds. With a smaller 7½cm pastry cutter (or a smaller glass), score a smaller circle within the larger disc, but not all the way through. Glaze the pastry with the milk. Carefully lay the pastry discs, with the middle and outer edge intact, on the lined tray and bake for 10 minutes, or until risen, crisp and golden. Remove from the oven and leave to cool on a wire rack. Whisk the cream in a bowl until if forms soft peaks. Very carefully cut around the inner circle (that was scored with the smaller pastry cutter) of each pastry disc with a small, sharp knife and remove the excess pastry from the middle to leave a crisp pastry case. Mix the golden syrup into the whipped cream to make a delicate, sweet Chantilly cream. Fill the cases with the cream and top with mounds of strawberries. Heat through a little more golden syrup and use a pastry brush to glaze the strawberries before serving.